As a life long resident of Connecticut, but also a life long born again Christian, I have no idea what it's like to not live in a mission field. Connecticut, all of New England in fact, has some of the lowest concentrations of evangelical Christians in the nation. This means most (~95%) of my fellow flinty New Englanders do not share my belief in the Bible as the Word of God, in Jesus as the only savior of our souls, in salvation by grace, in a lifestyle of worship characterized by ethics defined biblically, etc. But it wasn't always so in the history of my neck of the woods. I was encouraged to read the similarity of the culture in New England 400 years ago before Jonathan Edwards witnessed a revival, America's First Great Awakening which broke out in his neighborhood of Northhampton, Mass. Then his grandson, Timothy Dwight witnessed a revival at Yale, in New Haven, Conn. a hundred years later. Dwight's observations show me that no matter who the anti-Christian philosopher of the era is, the effects are the same. Wow! The more things change, the more they stay the same. The authors look at revival stories in Scotland, Korea, China, Uganda, Kenya, and Rwanda. Ministers had labored so long and seen such a small change until God took over and suddenly the christians in name only were transformed and the unbelievers turned to Jesus in mass, as if God had decided when the tipping point was the proceeded in the tipping. This book has encouraged me to not give up hoping that God can once again tip the hearts of my friends and neighbors. There is no region too hard for God to bring to life, to his glory. 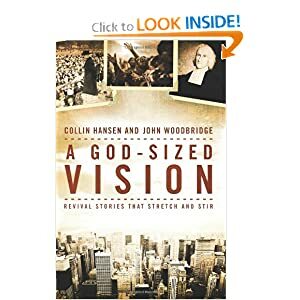 My only disappointment in the book is the choice to not mention the Pentecostal revival which seemed to have tipped at Azusa Street in Los Angeles in 1906 and has spun off numerous denominations that if counted as simply Pentecostals, account for the 2nd largest Christian group after the Roman Catholic Church, perhaps half a billion believers around the world. That's a very significant revival story to neglect in a book about revivals. I feel like I was served pineapple upside down cake without the pineapples. It is an excellent book, but it's missing an ingredient, if not the ingredient, that practically defines it. Who can think of Christian revival and not think of the Pentecostals and their emphasis on the power of the Holy Spirit? Apparently Hansen and Woodbridge do. But the rest of the cake they serve up is otherwise excellent. Thanks to Zondervan for the free review copy.